Vintage Neon Signs. In 1675 the Theory of Neon was born. It was in the age before electricity and the man named Jean Picard noticed that there was a faint glow in his mercury barometer and specifically when it was shaken. A barometric light occurred however it was not understood at that time that it was the static electricity that caused the tube to glow. It was investigated but not understood at that time. A German named Heinrich Geissler was a glass blower and physicist who invented the Geissler tube. After electrical generators were invented many inventors and scientists started experimenting with a mixture of gases glass tubes and electrical power sources. Eventually they discovered that under low pressure these gases would glow with an electric current that was applied to the tube. After years of expermenting using many different types of discharge lamps, vapor lamps they discovered that this lighting device that was transparent would glow when they applied electric current to gas filled tube. These discoveries were made both in the United States and Europe. “Neos” became the Greek word for neon and its meaning was “new gas”. In 1898 in London England William Ramsey and M.W. Travers discovered neon gas. Its a rare gaseous element found in the atmosphere. There is one part neon for 65,000 parts of air. To obtain the neon from the air it went through a liquefaction of the air, then separated with a function called “fractional distillation” and this was separated the neon from the other gases. Claude Neon, his French Company name sold the first neon sign to “Packard Motor Company” in 1923 for a staggering prive of $24,000. Earl C. Anthony was the owner of this Packard Dealership in Los angeles California. People from all arounf the country came to visit this new attraction of the first “NEON SIGN”. The public was amazed at the sign that could be seen glowing in the daylight. It was nick nicknamed liquid fire and became very popular for indoor and outdoor signs. First step in making neon tubes is to buy a nice neon plant & I have a great Daco system for sale…Its top of the line and you can pump up to 4 units at a time. Next step is to get raw tubing which comes in different length stick and the most common is 4′.Then you will need torches, mercury, electrodes and other miscellaneous supplies. There are several types of glass compositions, soft glass is lead glass, soda lime glass and barium. Hard glass is from the borosilicate family is also used. First the glass is heated with specific torches using forced air with lit gas. Usually the heat range is 1600′ to 2200′ degrees Fahrenheit. Hollow glass tubes used to make neon lamps come in 4, 5 and 8 ft lengths. To shape the tubes, the glass is heated by lit gas and forced air. Several compositions of glass are used depending on the country and supplier. What is called ‘Soft’ glass has compositions including lead glass, soda-lime glass, and barium glass. “Hard” glass in the borosilicate family is also used. Depending on the glass composition, the working range of glass is from 1600′ F to over 2200’F. The flame is usually around 3000’F. The tubes can be cut by scoring them with a file while the tube is cold, then they are heated with specific torches and bent using a pre drawn pattern. After bending the tubes to desired pattern its ready to be processed. The tube is evacuated of air then short circuited with high voltage bombarding until the tube reaches 550′ F. The tube is evacuated again until it reaches a vacum of 10-3 torr. It is back filled then with neon or an argon mercury mixture. Neon filled tubes come out red in color and argon mercury comes out blue in color. They are filled to a specific pressure depending on the tube diameter then sealed off. There more than 150 colors using phosphor coated tubes filled with argon mercury. The most vibrant and saturated colors come from a Europeans classic stained glass that is simply beautiful, however a little more difficult to work with. Some must follow tips for you to purchase vintage neon signs! It has been more than a decade now since neon signs are brightening the streets of the USA during nights. They were first developed more than 100 years ago. Since their invention, they are always considered as a better way to execute information in a beautiful and attractive manner. This is what made neon signs a popular way of advertising also. 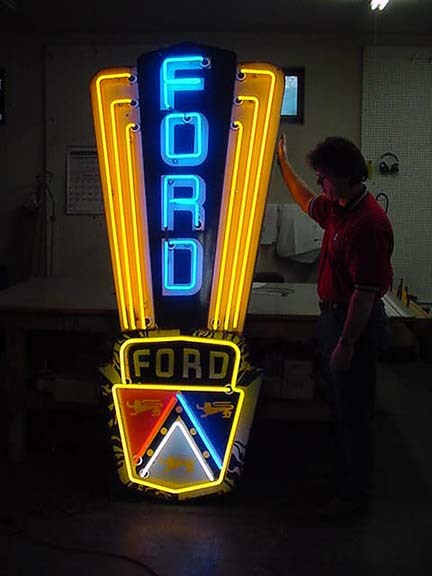 Various kinds of neon signs have been made since their invention and some of them have become quite popular among the vintage signs collectors. This is what made many signs sellers provide vintage neon signs for sale also. If you are one such vintage neon signs collector then you must be looking for such signs all the time. But, do you know that lots of factors are there that affects the signs. Purchasing any sign without checking those factors may cause you a great loss and disappointment. So, if you do not want to face such situation then follow the tips given below while purchasing any vintage neon signs from the market. Rarity: A more uncommon neon sign will have greater value than a common one. A neon sign is considered as rare if few are manufactured, many are manufactured but only a few have still remained, the method used for its production is complicated in comparison to its era, and the design, colors, and size is very unusual according to its time. Check all the above factors before purchasing any vintage neon sign to know how much rare it is. Authenticity: There are many reproduction neon signs available in the market. So, you have to do some homework before purchasing any kind of vintage neon sign. If the sign you are purchasing is not authentic then it is valueless. Various types of method are present to make a sign look old and authentic. So, if you are not sure, please take an expert with you to check the authenticity of the signs before putting your money in it. Condition: No matter how collectible the neon signs are its condition give a great impact to its overall value. The conditions of the neon signs classify it into various groups. The better the condition of the signs, the more they will be valuable and vice versa. So, checking the conditions is also important while buying vintage neon signs for sale. Desirability: The demand law also applies to the neon signs. The more they will be in demand; the greater will be their value and vice versa. So, check how much the neon signs are in demand before throwing your money on it. Road Relics is one of the reputed companies to provide vintage neon signs for sale. You can contact them through their online website roadrelics.com. They buy and sell genuine signs only. They mainly deal in signs from late 1800’s to 1950’s. This company promises to refund the full amount along with any shipping charges if any issue is found with the signs. Some of the famous signs they deal in are old signs, antique signs, etc. To know more, feel free to check other online articles also.